Which Of These Things Did Sailors Throw Overboard To Calm Stormy Seas? An Entanglement Of Rats Is Called A? Here’s a curious tradition that, even if you’re a well-salted sailor yourself, you may be entirely unaware of. 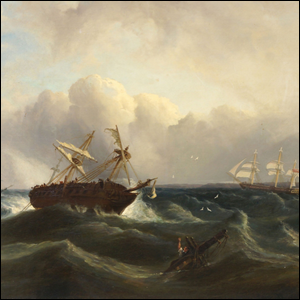 For centuries, it was common practice for sailors to deploy “storm oil” to battle rough seas. Typically, the practice involved throwing a large bag of vegetable or whale oil over the side of the ship and dragging it (or hanging it from the side of the ship), letting the movement of the water slowly disperse the oil from the bag. While it would be incredibly easy to write off the use of storm oil as a sailor’s superstition (using whale oil, especially, smacks of a superstitious undertaking), there’s actually a bit of scientific merit to the act. While chucking a bag of oil into the ocean beside your ship won’t stop a hurricane in its tracks or force towering swells to die down to nothingness, oil on the surface of the water does in fact calm the water by reducing the friction between the wind and the water, leading to a decrease in water movement immediately around the ship. The effect was so well documented, in fact, that it was actually mandated (well into the late 1990s) that British vessels carry storm oil, and the United Stated Maritime Service Training Manual listed storm oil as a piece of general equipment to stock in life boats. Painting by William Garthwaite (1821-1889).